"Roger. Taxiing into position. We are ready for take off." Should have said this the pilot, but this time... I was already sleeping! I stayed up all night on my last day in NYC. Another flight, another adventure and I still had to say goodbye to the big apple. So it was that when I fastened the belt on the airplane I fell alseep and when I woke up I was in... California! Arrived in Irvine I fulfilled one of the coolest things in my todo list of ever: become an actual CouchSurfer! Thanks to Shawn who responded to my "Couch Emergency Request" sent from NYC I found a new friend in Irvine even before my arrival. And so it was that I met his roommates: Jennifer, Saba and Shawn2 (who actually is a guest of Saba) and I set up a temporary base camp in his living room. In exchange I cooked an Italian lunch for the whole apartment, I hope they enjoyed it! In addition to host me Shawn showed me the campus and introduced me to some of his friends. We also spent some time together having fun and doing interesting conversations. He is really an awesome person! It's difficult to describe how beautiful (and green!!) is the University Campus and its surroundings. The main part of the campus is disposed in a circle of 1 mile around a central green park where everybody can walk and stop to study under the trees. Along the ring outside the park are placed the buildings of the faculties, always surrounded by trees, coffee shops and relax areas. The whole area is so big that it's difficult for me to do pictures that really give you an idea of the campus! Also the weather is great! From 11 am to 4 pm the sun's rays strike too hotly while the rest of the day you can walk in tshirt like in the middle of august on an italian beach. It's great! I was sad to not be there with them but I am really really happy for the marriage and I hope to see them soon. Congrats friends, I wish you a world of happiness!! 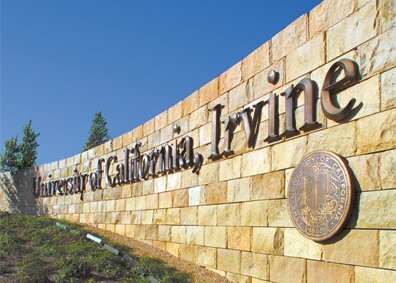 Almost the day after my arrival in Irvine I had already meet 3 other students just arrived in Irvine with the EAP program. We quickly created a nice group that rapidly grew up to 12 students. We already went to beach, played several matches of BeerPong, partecipated in some parties casually met by night and done other funny things as walking in the street with a mattress :) A group of international students is definitely one of the most funny things you can join! PS: I have a new american phone number! here it is: "240 diego89"